The photobook created from the project has been selected for exhibitions at museums and galleries around the country, including: the Griffin Museum of Photography in Winchester, Mass, the Davis Orton Gallery in Hudson, New York, and the Phoenix Art Museum in Phoenix, Arizona. The 2018 trade version of the book (with a different soft cover) is currently available for purchase below. How people deal with change has always fascinated me. I didn’t examine how I deal with change until I became a father. My wife and I became parents in 2009 when our daughter, Maisy was born. Adapting to the change of becoming as a new parent was very difficult for me. I was constantly being pulled in multiple directions and was unsure of my role a father. As my daughter got older, things had become a little easier. The fear I had known when she was a newborn was now replaced with a sense of hope that helped to erase those initial insecurities. Between ages two & five, she was in daycare, although I would still spend a day working at home with her. I was lucky to have been able to spend time with her while she was young to see the beginning of her self expression and personality develop. As she now attends school, my role as a parent continues to evolve. Its a challenge to introduce the responsibilities of life to a child yet allow them to keep that sense of youthful wonder. I now feel it's my responsibility to preserve her sense of curiosity. Part of the change parenthood has brought is noticing what I have lost as an adult and the recognition of what I wish I still had as I grow older. 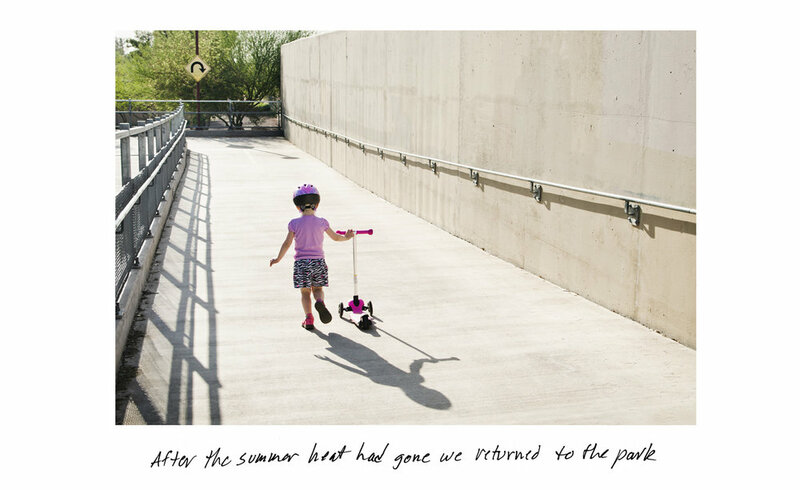 As one of the leading Phoenix Photographers Mark Peterman explores narrative storytelling through photographs and multi-media, usually consisting of constructed realties that cross over into implied fiction. His personal work has been an American Photography (AP28 + AP35) and Photo District News (PDN) annual award winner. His independently published photo books have been included in exhibitions around the country at museums and galleries that include: The Griffin Museum of Photography, Phoenix Art Museum. and Month of Photography Los Angeles (MOPLA).